Google Apps has been a silent force taking over the enterprise both public and private sector. Google Apps is the enterprise version of the free web apps we are used to – Gmail, Google Calendar, Google Docs, etc. Most web applications rely on just an username and password and this is inherently insecure. Enterprises deal with this usually with the popular RSA keyfob based two-factor authentication systems. With 2-factor authentication, besides entering the username and password, you have to enter a pin and append it with dynamically generated string of numbers from your RSA keyfob. This makes it very secure to access stuff online. Even some banks have started to do this for online access to their clients. 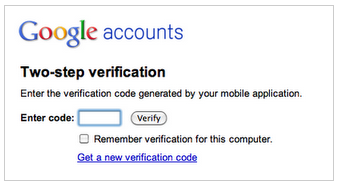 Google has now introduced the two-step verification for Google Apps accounts. Instead of a key fob, they have ingeniously utilized another device we constantly have on us – mobile phone. No special tokens or devices required. Once you enter your username and password, a verification code is sent to your mobile phone as SMS, voice calls or generated on an application for Blackberry, Android or iPhone. Two-step verification is available to Admins of Google Apps Premier, Education and Government now. Stand Edition Users (free) can expect to see it in the months to come. Once enabled, end users can set this up in the Accounts tab in Gmail Settings. Google has taken a right step in making Google Apps more attractive to Enterprises with security where the pricing was already really attractive. Chase bank does this already and I really like the security comfort it offers and great to see Google Apps offer it too.